Drink less wine, drink more beer. Sail less alone, sail more with friends. Eat less broccoli, eat more bananas. They scoffed at me when I wrote about Safety for solo Laser sailing and suggested that carrying a praddle might not be a bad idea. But bonnie from frogma went Sunfish sailing in the chilly waters off Brooklyn today and what's that we see on her foredeck? A praddle! 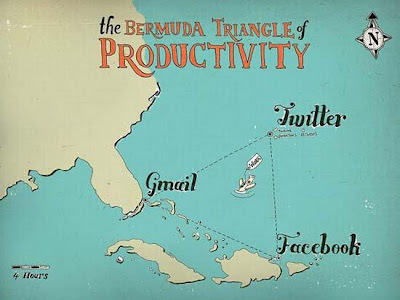 In January I didn't do any Laser sailing but I was blogging up a storm. The month started with a post about my friend Antolin sitting on a toilet holding a toilet plunger and ended up with some nonsense about how I would like to be a jellyfish. In between I did write one or two serious post about the state of Laser sailing in the world including a much commented post on the topic of Fairness. 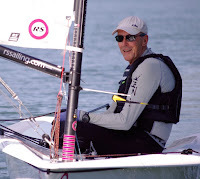 In February I didn't do any Laser sailing but was blogging away like crazy on such diverse topics as Coarse Sailing and debating the pros and cons of whether I should go to the 2011 Laser Masters Worlds in San Francisco. We also had fun with one of our most popular group writing projects ever, this time on the topic of Navigation. You can see all 25 entries here. You the readers voted the entry by Bonnie of Frogma as the one you liked the most. As we all know she is Buoy Crazy. 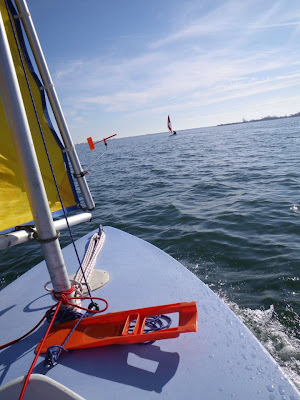 In March I didn't do any Laser sailing, and you can see from my blogging that month that the deprivation was beginning to affect my mind. I went on a wild spree of writing over twenty consecutive posts inspired by titles and lyrics of Simon and Garfunkel songs. What was I thinking? One of the few serious posts that month was about a major issue facing the Laser Class that might force us to split into Three Laser Classes. In spite of the best efforts by our class leadership, this issue is still unresolved today. For the first three weeks of April I didn't go Laser sailing. By this time my Laser sailing withdrawal symptoms were getting serious and I was even crabby to one of my dear online friends, who kindly recommended a dinghy fix as treatment for my crabbiness. God it was good to get back in the boat again, even if I was pretty Rusty. One of the most popular posts in April was a post about Safety in which I discussed all manner of possible safety equipment that might be carried by anyone who is crazy enough to go off sailing his Laser alone on the ocean wide. I only sailed my Laser once in May and my blog suffered even more from the mental distress this lack of dinghy fixes was causing. I rambled on about extinct Olympic sports and Pippa Middleton's bottom, until in the middle of the month I turned the blog post writing function over to my readers by starting a group writing project, challenging participants to write boating related posts inspired by the titles or lyrics of Beatles' songs. This time there were 34 inventive, amazing entries - 28 here and 6 more here. 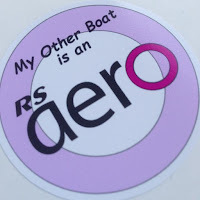 In June I blogged less and sailed my Laser more. About bloody time! With the Laser Masters Atlantic Coasts coming up at the end of month I got in several days of practice sailing, including my famous (well it will be one day) cameo appearance in the movie Moonrise Kingdom. The Masters regatta turned out to be a bit of an anticlimax for me after an attack of the dreaded finger cramps. Damn! Damn! Damn! In July I went Laser sailing on 13 days. Woo hoo! Life is back to normal. Or what I wish "normal" was. I practiced a different technique aimed at avoiding the dreaded finger cramps as recommended by the wise old man of Lake Eustis. I played in the waves off Little Compton. I did the Newport Regatta and found my groove (well I did in one race!) I sailed in the Lipton Cup in Quincy and discovered the joys of not playing the Red Sox. I played Lake Sailing Roulette at Lake Massapoag. Sometimes I went for a bit of a yot on Tuesday evenings in Bristol, including the evening we went searching for the mythical Red Can. And then at the end of the month I sailed the three day Hyannis Regatta, perhaps the most rewarding regatta of the year. After Hyannis, I enjoyed a few days with my grandkids on the beach on Cape Cod, and then the first weekend of August I did the three day Buzzards Bay Regatta. There was a frustrating light wind day when you had to remember to Always Look on the Bright Side of Life, a classic Buzzards Bay hikefest day, and a day that was a washout. That's sailing for you. After Buzzards Bay, I took it easy in August with a bit of local sailing and some Tuesday evenings in Bristol, while some of my buddies were off in San Francisco performing all sorts of heroics. In September I went off to Europe and had a couple of marvelous weeks at Minorca Sailing. I had one very productive week working with an excellent Laser coach who helped me fix various flaws in my technique, and in the second week I got to play in some of my dream boats such as the Laser SB3 and the RS100. I could have blogged a lot more than I did about the whole experience... but I didn't. The first weekend in October I sailed in the Last Blast Regatta at Quannapowitt YC and surprised all my buddies and myself by winning the first race! Woo hoo! 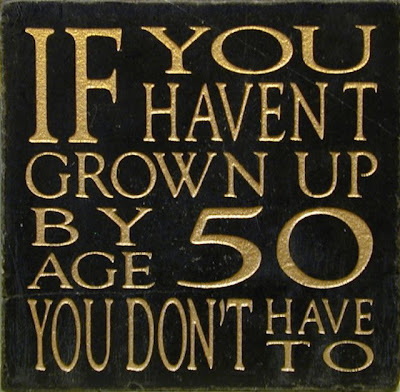 I guess that coach in Menorca knew what he was talking about? Later that month I ran the Newport Half Marathon. In November I went out racing with the Newport Frostbite Fleet on the first week of the season, and made a lot of my male readers very happy because that was my 43rd day of Laser sailing this year. The next weekend I ran in the inaugural Citizens Bank Newport Pell Bridge Run, and a few days later celebrated the happiest event of the year. After a few posts stirring up some debate about helmets for sailors, I wrote a Thank You post to all my readers and decided to stop blogging. In December, Tillerwoman and I had a wonderful vacation at the Bitter End Yacht Club in the BVI. There was Laser sailing. There was racing. There was rum when I won. There was lots of sailing and kayaking with Tillerwoman. There was beer can racing, and there was beer even when we didn't win. I didn't blog about any of it. 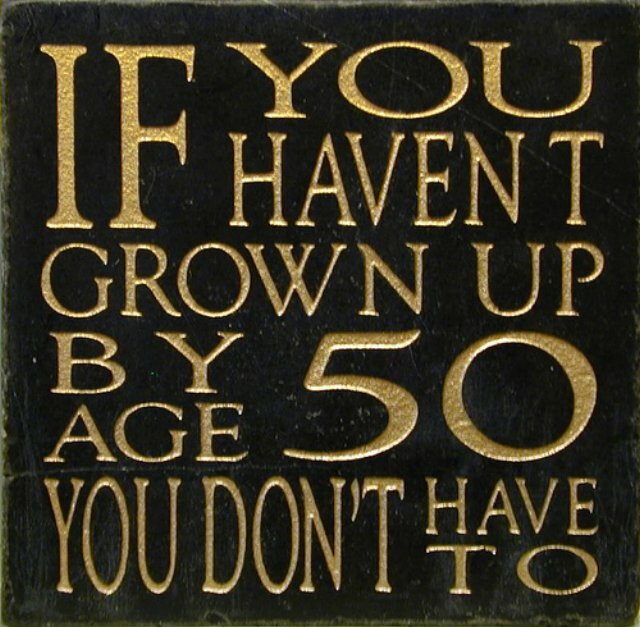 It's been a funny old year.